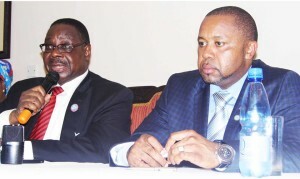 BLANTYRE-(MaraviPost)-The Malawi Law Society (MLS) on Thursday accused President Peter Mutharika for kicking out his deputy Sauolos Chilima of the cabinet arguing that the decision is illegal. The society President Alfred Majamanda bashed President Mutharika for violating Section 92 (1) of the constitution. Majamanda observed that according to the supreme law of the land, the vice president must be in the cabinet either he/she is good terms with the President or not. Chilima has been sacked out of the cabinet when he is in Dubai. President Mutharika on Wednesday evening kicked his deputy Chilima out of the cabinet in the latest reshuffle. President Mutharika also removed Ana Kachikho, former Lands Minster replaced her with Jean Kalirani who was Gender Minister. Another casualty is Mukumbwa as new comers include Welani Chilenga who is now the deputy Natural Resources Minister while Charles Mchacha is the deputy minister of newly name Homeland Security (formerly Home Affairs and Internal Security). Kalekeni Kaphale is back into the cabinet as Attorney General (AG) replacing Charles Mhanga who according to Chief Secretary to The Government Lloyd Muhara, the latter resigned. Mhango resignation comes a day after the former AG failed to block the United Transformation Movement (UTM) from being registered at the High Court. Nicholas Dausi has been shifted from minister of information and communication technology to minister of Homeland security (ministry renamed and Dodma to be transferred to this ministry). Henry Mussa is now minister of information and communications technology, Jean Kalilani has been appointed minister of Lands, Housing, and Urban development. Francis Kasaila is now minister of industry, trade and tourism, Grace Obama Chiumia has been appointed as minister of Labour, Youths, Sports and public works, Cecilia Chazama to minister of Gender, Children, disability and social welfare. Atupele Muluzi, Jappie Mhanga, Bright Msaka, Samuel Tembenu, Emmanuel Fabiano, Joseph Mwanamveka, Goodall Gondwe, Kondwani Nankhumwa and Aggrey Massi have retained their ministerial posts including health, Transport, Education, Constitutional Affairs, Foreign Affairs, Agriculture, Finance, Local Government and Natural Resources respectively.